Exceptional Mediocrity: As Seen On TV! 1. 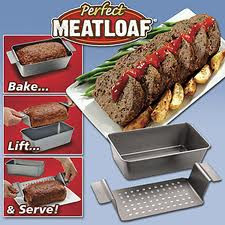 The Perfect Meatloaf Pan – The premise is a “revolutionary” two-part tray that allows you to bake and server your meatloaf without the hassle of transferring it from a traditional pan to a serving plate. This process prevents the meatloaf from “falling apart” and keeps it visually appealing. 2. 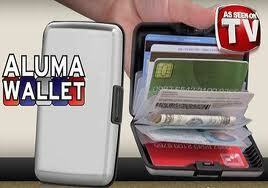 The Aluma Wallet – This handy accessory is an “indestructible, water-resistant, and easy-to-use” aluminum shell in which to carry your cash, cards, and pictures thereby making your old leather wallet obsolete. The commercial features a man explaining that getting a leather wallet wet is not a good idea and that the aluminum shell prevents identity theft by blocking your cards RFID signal. In regard to the “easy-to-use” characteristic, if you find yourself unable to grasp the concept of a tradition bi-fold wallet by adulthood perhaps you should not be participating in any complicated financial transactions. Secondly, they give you two with each order so that you can have one as a spare. Doesn’t that undermine the primary selling point of its indestructability? I suppose the identity-theft shielding is a plus but then again the metal casing means that some punk could pick your pocket with the magnet he lifted from science lab. 3. 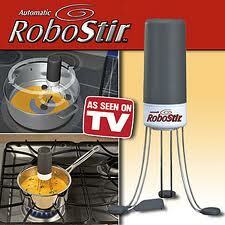 The Robo-Stir – As the name would imply, this is a battery-operated device that you place inside a pot of food on the stove so that you do not have to stir the food as it cooks. It is equipped with several gyros that agitate the ingredients so that you do not have to expend the energy. Let me tell you something, if you are unable to muster the energy necessary to move a wooden spoon in a circular motion for thirty seconds it is highly unlikely you would be motivated enough to cook dinner at all. Is it really quicker to fire up a culinary hand-tiller than just move a utensil? And what happens if the thing gets off balance and falls into the gumbo? Since the battery compartment isn’t waterproof, would the broth short out the circuitry? Will dinner then taste of languor and AA batteries? 4. 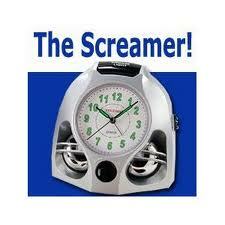 The Screamer Alarm Clock – This stylish nightstand accessory is customized for the heavy sleeper. Its patented design is guaranteed to wake those who can sleep through even the loudest sirens, alarms, and noises. If it takes a custom built machine with a decibel warning to return you to consciousness each morning, then you might want to stop chasing your Ambien with prescription cough syrup. What happens if you share the bed with a light sleeper? You are being gently coaxed from your slumber and meanwhile your wife has involuntarily wet herself twice since 6:00 AM. Ironically, the list of clients for this device would be a gold-mine for professional cat-burglars. 5. Luna Talking Pillow – This is a battery operated children’s pillow that allows you to record a message that the kid can play back by simply by squeezing it. They tout that the recording can be used to comfort “your child with a soothing voice they know” while “separated” from their parents or legal guardian. They suggest reading a book or recording a personal message to the child that will reassure them. Do not forget the Popeel ? pocket fisherman !